A view of Westminster Bridge. The four-storey terrace stands in front of the site of Portcullis House. Across the water, the London Eye is still almost two centuries away. 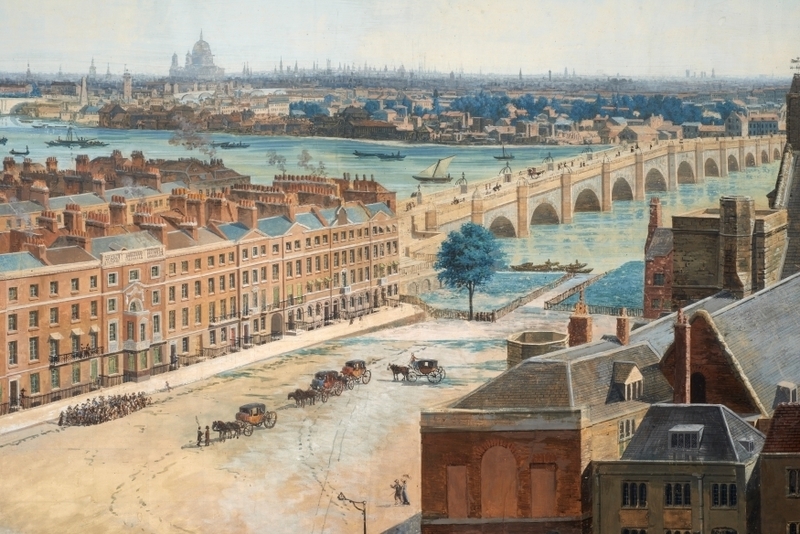 This is what London looked like in 1815. No skyscrapers, no double-deckers... not even Big Ben. 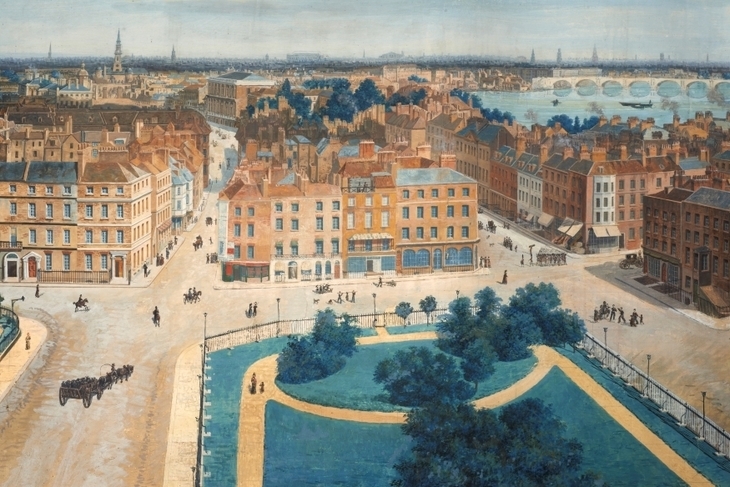 A rarely seen panorama of London by French artist Pierre Prévost is to go on show at the Museum of London. The full panorama. Click for larger size. The painting — a study piece for a now-lost panorama on a larger scale — was acquired by the museum in 2018. This is the first time it has gone on public display. The long roof belongs to Westminster Hall, which still survives. All other buildings in the old Palace of Westminster were lost in the fire of 1834. Big Ben would be roughly where the tree stands to the left of the painting. Westminster Abbey is just visible to the right. Prévost made his study from the top of St Margaret's church, beside the Abbey. It shows a lost London of steeples, chimneys and horse-drawn vehicles. Parliament Square and the view down Whitehall. The sturdy building at the 11 O'Clock position is Banqueting House — a survivor from 1619 that still stands today. In the distance, Strand Bridge (soon to be named Waterloo Bridge) has recently been completed. The panorama will be on free exhibition at Museum of London from 15 March until September 2019.